People’s United Financial, Inc. (PBCT) has reached the necessary 25 years of consecutive dividends and is a member of the S&P500.. This article will provide more detailed information on People’s United Financial, Inc. (PBCT) business model, peers, dividends, growth potential, recession performance and valuation. People’s United Financial, Inc. is a savings and loan holding company and was founded in 1842 in Bridgeport, Connecticut. People’s provides commercial, retail, and business banking, and wealth management services to individual, corporate, and municipal customers. People’s annual revenue is $1.8 billion, has $48 billion in total assets, and a market capitalization today of $6.2 billion. The dividend growth and payout ratio are steady and in the “save” range around 50%. No Data available for Dividend History. We analyzed each Dividend Aristocrat by looking at their earnings, dividends, maximum draw down (MDD) and stock price performance during the 2007-2009 financial crisis. 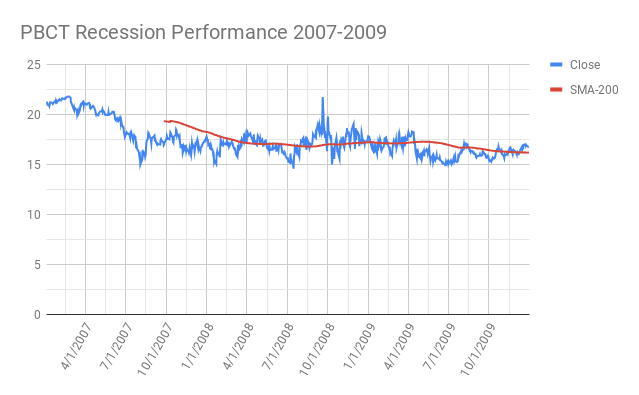 Not surprisingly, since People’s is active in the Financial sector, the recession period 2007-2010 has been difficult, but a little bit better than the large financial institutes. Dividend Aristocrat People’s United Financial has been able to increase dividends for 25 consecutive years, include the 2007-2010 period. Based on the current valuation, which are below the 10 year averages and the earnings-per-share growth at 5% annually, the People’s stock is on an attractive share price level. Especially with the high yield and positive dividend growth every year.